This document has been supported by the Marxist Leninist Maoist Center of Belgium. Communist Party of Peru, On Gonzalo thought. The present document is a project to introduce to the concept of “guiding thought” through questions and answers on individuals which have played a great role in their own country, precisely in formulating a “thought”. This project is called to progress and to win in completeness, in the quality of the explanations, but also in the quantity of individuals whose life is here shortly presented. Indeed, in each country, class struggle generates individuals who proceed to the analysis of their own social and national reality, understanding the contradictions they live in, paving the way for progress through revolution, i.e. New Democratic Revolution or Socialist Revolution. The “thought” of the individuals here concerned is the reflection of the movement of eternal matter; those individuals are not “genius” with great “ideas”, but people understanding reality in the dialectical materialist way and accepting it as it is. “All-sided, universal elasticity of concepts, an elasticity reaching to the identity of opposites, – that is the essence. This flexibility, applied subjectively = eclecticism and sophistry. In this sense, we hope this document will help to forge guiding thought in each country, guiding thoughts which are the reflect of the eternal movement of matter, advancing to communism. How and in which context did comrade Akram Yari Guiding Thought evolve? The revisionist PDPA (People’s Democratic Party of Afghanistan) which was a pro-Khruchievite party, in mid-1960s, was to bring about a betrayal to democratic revolution of Afghanistan. Indeed, the rank-and-file of this party, ideologically, was filled with petit-bourgeois minded intellectuals who were tailing a social-imperialist ideological model. In such a context, a “No!” was upheld! This came from a young revolutionary, who neither reconciled with revisionism even a moment, nor neglected fighting it. This was comrade Akram Yari, who by the formation of PYO (Progressive Youth Organization) established the first anti-revisionist organization in Afghanistan. PYO was a Maoist organization, in indeed Akram Yari Thought was the theoretical expression of this organization in context of national and international struggle against revisionism, a struggle which gave birth to the first Maoist organization in Afghanistan. How and in which context did comrade Ibrahim Kaypakkaya Guiding Thought evolve? The Communist Party of Turkey was found by Mustafa Suphi (1883-1921), but collapsed soon because of kemalism, the nationalist ideology of the bureaucratic bourgeoisie taking power on the ruins of the Ottoman Empire. Born in 1949, Ibrahim Kaypakkya’s produced a thought which merged as the most developed part of a whole revolutionary wave produced by the masses (others famous figures which promoted armed struggle were the guevarist Mahir Cayan and the hoxhaist Deniz Gezmiş). The main question was to understand the nature of the Turkish regime, and its origin: the kemalist “revolution”, a counter-revolution that was considered by opportunism as “bourgeois” or even “democratic and betrayed”. Ibrahim Kaypakkaya studied the nature of Turkey, its history since its founding by Mustafa Kemal, affirming its semi-colonial semi-feudal nature and the necessity to follow the path of the New Democratic Revolution. How and in which context did comrade Siraj Sikder Guiding Thought evolve? After the Russian revolution, the Communist party was formed in India, but this party did not lead the peasants to armed struggle against British colonialism and its feudalist basis, and denied to lead their armed struggles. Moreover, during Second world war, it tried to push Indian people to the unity with British in the name of line of an anti fascist united front, and as a result, Congress and Muslim League that are representative of Hindu and Muslim bourgeoisie and feudal of India respectively gave birth to India and Pakistan named two semi colonial semi feudal states by making communal class contradiction antagonistic. As majority mass peasants of East Bengal as Muslim was object of communal exploitation and suppression by the Hindu Jamindars, and as the problem was not solved through revolution, Muslim peasantry of East Bengal voted in favor of Pakistan. Since after the creation of Pakistan, backward East Bengal became a colony of the comparatively advance West Pakistan. People of East Bengal rose in rebellion against Pakistani colonial rule from language movement of 1952 and mass movement of 1969 up to national liberation war of 1971. The East Pakistan Communist party failed to lead people’s struggle in correct line. With the emergence of Khruschevyte revisionism internationally, that party became a revisionist party. As Chairman Mao led international struggle against that revisionism, that party got divided into two trends – Pro Moscow and Pro Peking faction. The Pro Peking faction could not free itself from revisionism. Comrade Siraj Sikder broke that chain of revisionism. How and in which context did comrade Gonzalo Guiding Thought evolve? With José Carlos Mariategui (1894 -1930), Peru produced a great leader who was able to build a real Communist Party, but after his death revisionism prevailed, with a line of “national unity” and then the one of modern revisionism. The context was one of raising of the mass struggles, but the ideological background was marked by the influence of revisionism. There was the need for a correct understanding of José Carlos Mariategui’s works about Peru, for a correct understanding of Peru as a semi-colonial semi-feudal country. “We have an understanding of the workings of contemporary Peruvian society, by which we mean the society which came into being in I895. We believe that the process we are living through began then and that there have been three stages. The first stage laid the basis for the development of bureaucrat capitalism; the second stage, which deepened the development of bureaucrat capitalism, began after World War II, because the first stage lasted until then. This deeper development of bureaucrat capitalism ripened the conditions for revolution. With the beginning of the people’s war in I980, we entered the third stage, of the general crisis of bureaucrat capitalism. The destruction of contemporary Peruvian society has begun because it has become historically outmoded. How and in which context did comrade Alfred Klahr Guiding Thought evolve? Alfred Klahr was a eminent Party activist from the communist move-ment in Austria. Because he was particularly under police attack in the middle of the 1930’s, he led the Austrian section of the Lenin school in Moscow, from 1935 to 1937. During this period, he developped a very deep analysis of the Austrian society, how its nation emerged from the German part of Europe to take another direction, oriented to the East. This permitted to understand the situation in a country where the clerical Austro-fascists were in conflict with the Pan-German national-socialists, each being expression of different social classes. Did comrade Akram Yari form a new party or join a preexisting party? In many countries, anti-revisionism was carried out by splitting from Communist parties whom fell into revisionism. But, in Afghanistan, anti-revisionism was not carried out by splitting from a former party. Before formation of PYO, comrade Akram Yari was not member of any organization. PYO was the initial steps of chairman Akram Yari, and also his greatest initiative. Did comrade Ibrahim Kaypakkaya form a new party or join a preexisting party? Ibrahim Kaypakkaya was only 21 when he joined the TIIKP (Revolutionary Workers and Peasants Party of Turkey). He learnt from the great strike of mid-june 1970 and began to work in the review of the TIIKP, which officially was promoting Mao Zedong’s interpretation of Marxism-Leninism. Supporting the Great Cultural Proletarian Revolution in China, he organized a revolutionary fraction in the TIIKP, producing his thought. Then, in April 1972, he broke with the TIIKP, to form the Communist Party of Turkey / Marxist-Leninist, the TKP/ML. Did comrade Siraj Sikder form a new party or join a preexisting party? Siraj Sikder formed a new party as the existing communist party fell in revisionism. Siraj Sikder is the greatest son of Bangladesh who led the proletariat here to take up Mao Thought as development of Marxism-Leninism. On that basis he correctly analyzed the society of East Bengal as colonial-semi feudal, led the proletariat to form its own party, armed force for the first time in history, united front by mobilizing peasantry, middle class and national bourgeoisie and building Base Areas. He formed Mao Zedong research center in 1967 to make ideological preparation of a proletarian party, formed East Bengal Workers Movement in 1968 as a preparatory organization of a proletarian party, initiated armed struggle in 1970 and formed Proletarian party of East Bengal in 1971, in liberated base in Barisal in southern Bangladesh. Did comrade Gonzalo form a new party or join a preexisting party? Gonzalo led a fraction work to reaffirm the value of Mariategui and to give a correct direction to the Party. “The first period, the first part, is the Founding of the Party, in which we were fortunate to have José Carlos Mariátegui, a thoroughgoing Marxist-Leninist. But, inevitably, Mariátegui was opposed, negated, his line was abandoned and the constitutional congress that he left as a pending task was never held. The so-called Constitutional Congress that was held approved, as we know, the so-called line of “national unity,” which was totally opposed to Mariátegui’s theories. In this way the Party fell headlong into opportunism, suffering from the influence of Browderism, which Del Prado was linked up with, and later, modern revisionism. This whole process takes us to the second period, that of the Reconstitution of the Party. This is, in sum, a struggle against revisionism. It is a period that we can clearly see beginning to unfold with a certain intensity in the beginning of the ’60s. This process leads the members of the Party to unite against the revisionist leadership and, as I have said before, to expel them in the IVth Conference of January 1964. Did comrade Alfred Klahr form a new party or join a preexisting party? Alfred Klahr joined the Communist Party of Austria. Did comrade Akram Yari consider itself as a product of the Great Proletarian Cultural Revolution? PYO was active in stormy years of GPCR. Comrade Akram Yari fully supported the Proletarian Revolution and chairman Mao Zedong’s contributions to Marxism-Leninism, and adopted it as Marxism-Leninism Mao Zedong Thought, applicable to concrete conditions of Afghanistan. He considered Mao-Zedong Thought as the international banner of world proletariat against modern revisionism. He fully rejected “Three Peacefuls” and “Two Alls” of Khruschivites. He fully understood that PYO could surely be a frontline of combat under guiding line of GPCR, so that it could lead the struggle against pro-khruchivte revisionist party of “people’s democratic party of Afghanistan”. Did comrade Ibrahim Kaypakkaya consider itself as a product of the Great Proletarian Cultural Revolution? In the criticism of the program of the TIIKP, Ibrahim Kaypakkaya explains that “our movement is a product of the Great Proletarian Cultural Revolution”. Did comrade Siraj Sikder consider itself as a product of the Great Proletarian Cultural Revolution? Siraj Sikder thought was based on teachings of Great Proletarian Cultural Revolution. He formed Mao Zedong research center in 1967 to make ideological preparation of a proletarian party, and declared Marxism-Leninism-Mao thought as the third stage of Marxism. He carried uncompromising struggle against pro Moscow and pro Peking all sorts of wrong trends. Chinese state made compromise with Pakistani state in 1971 when Siraj Sikder was launching people’s war against Pakistan colonial state. He didn’t consider Pro China or any type of Chinese state activities as Maoist. It was his profound understanding of GPCR that led him to discard any type revisionism whatever its name or form is. Did comrade Gonzalo consider itself as a product of the Great Proletarian Cultural Revolution? “Yes, I’ve been to China. In China I had the chance, which I’d like to see many have, of being in a school where politics was taught, from international questions to Marxist philosophy. They were masterful lessons given by proven and highly competent revolutionaries, great teachers. Among them I can remember the teacher who taught us about open and secret work, a man who had devoted his whole life to the Party, and only to the Party, over the course of many years – a living example and an extraordinary teacher. He taught us many things, and he wanted to teach us more but some didn’t accept it – after all, there are all sorts of people in this life. Later, they taught us about military questions. But here they also began with politics, people’s war, then the forging of the armed forces, strategy and tactics. And then the practical part that went with it, like ambushes, attacks, military movements, as well as how to assemble explosive devices. When we were handling delicate chemicals they urged us to always keep our ideology first and foremost, because that would enable us to do anything, and do it well. We learned to make our first demolition charges. For me it is an unforgettable example and experience, an important lesson, and a big step in my development – to have been trained in the highest school of Marxism the world has ever seen. Well, if you’d like an anecdote, here’s one. When we were finishing the course on explosives, they told us that anything can explode. So, at the end of the course, we picked up a pen and it blew up, and when we took a seat it blew up, too. It was a kind of general fireworks display. These were perfectly calculated examples to show us that anything could be blown up if you figured out how to do it. They would tell us, don’t worry, don’t worry, you’ve already learned enough. Remember what the masses can do, they have inexhaustible ingenuity, what we’ve taught you the masses will do and will teach you all over again. That is what they told us. That school contributed greatly to my development and helped me begin to gain an appreciation for Chairman Mao Zedong. Later, I studied some more and I have tried to apply it. I think I still have a great deal to learn from Chairman Mao Zedong, from Maoism, as well as from Mao’s practice. It isn’t about trying to compare myself to him, it is simply using the highest pinnacles as a reference point for achieving our objectives. My stay in China was an unforgettable experience. I was there on another occasion as well, when the Great Proletarian Cultural Revolution was beginning. We asked them to explain what was then called Mao Zedong Thought. They taught us some more and that helped me understand more, a little more I should say. One thing that seems ironic is that the more I understood Mao Zedong, the more I began to appreciate and value Mariátegui. Since Mao urged us to apply creatively, I went back and studied Mariátegui again, and saw that we had in him a first rate Marxist-Leninist who had thoroughly analyzed our society. Did comrade Alfred Klahr consider itself as a product of the Great Proletarian Cultural Revolution? Alfred Klahr died before the GPCR, and even before the success of the Chinese New Democratic revolution in 1949. What were Akram Yari’s main documents? The program of PYO, drafted and then adopted principally in second congress of PYO. Misfortunately, most of the writings of comrade Akram Yari, still are unavailable. He has buried them, to save them. From the time of King Zaher till PDPA regime, all reactionary regimes were chasing and suppressing clandestine Maoist elements. Revisionist PDPA while in power was the principal enemy of Marxist-Leninist-Maoists of Afghanistan. So, comrade Yari hid his hand writings. 1°) Lack of printing houses: almost all of the printing houses were of and under control of state. 2°) No accessibility to modern printing machine, and no budget for that purposes. PYO had no struggle economical backbone. It mainly gained contributions mainly of its members as membership fee. 3°) Due to dangerous situation and highly police states during times of King Zaher, and later on during “ president term” of Lord Dawod, there was no secure and facility for printing houses. Most of the few available clandestine hand printing machines were unveiled and arrested by security forces, and the revolutionaries were always sent to jail, and worse than that: shot to death. If there are few documents remaining from Chairman Akram Yari, then, how can you prove his guiding thought having been formed? Akram Yari: a generation of communists was taught by him. They learned from him that: it is the proletarians of Afghanistan who is the vanguard of revolution of Afghanistan. They learned from him that: our coming revolution is a democratic revolution of a new type: a New Democratic Revolution. They learned from him that: our revolution is part of world proletarian revolution. And finally, and mainly they learned from him that: Maoism has contributed and taught the continuation of revolution under dictatorship of proletariat, and today, to be a Marxist means to be a combatant of shining trench of Marxism-Leninism Mao-Zedong Thought (Maoism was then named Mao’s Thought in 1960s, as are all aware of this). Today, Organization of the workers of Afghanistan (Marxist—Leninist-Maoist, principally Maoist) holds that: it is the guiding thought of comrade Akram Yari which gives us the strength and liability. Neglecting this shining trench, as the history of these four decades proved, causes deviations from Maoism, and makes revolutionaries fall in revisionism. Parts of revolutionaries who separated their way from that of chairman Akram Yari’s line fell to dogma-revisionism of Enver Hoxa and revisionism of centrists who claimed Guevarism, and finally gave up to revisionist PDPA. It is shining line of comrade Akram Yari, which has always represented Maoism and contributed to revolutionary praxis. According to our knowledge and summations, comrade Akram Yari is as crucial to Afghanistan revolution as comrade Mariategui was for Peruvian revolution. Mariategui’s line, contributed in formation of Gonzalo Thought. Because of being the initiator and the founder, and because of establishing the Maoist line in Afghanistan, we call the application of Maoism in Afghanistan as Akram Yari Thought. Otherwise, it is Organization of the workers of Afghanistan (Marxist-Leninist-Maoist, principally Maoist) who at the present time is dedicated to develop the guiding thought of revolution in Afghanistan. Other sections and groupings, however claiming legacy of Akram Yari, still reject the formulation of (Guiding thought and great leadership). So, they fall apart and fail to participate in development of guiding thought of revolution. So, our organization is the only Maoist force in Afghanistan who stands in favor of Guiding Thought, and says: Guiding Thought of comrade Akram Yari, however generated, but still in formation and development, is the guiding thought of New Democratic revolution in Afghanistan and will also be the guarantee of triumph until communism. Our opponents and so called “Maoists” claim that: OWA (MLM p-M) is copying PCP. We say: NO! We are reviving Maoism in Afghanistan! Our work is the leading core of development of Akram Yari Thought. However this thought does not fully inhere its development from Akram Yari directly, but, historically and basically, it is Akram Yari‘s teachings which is being developed by our organization and being presented as guiding thought of revolution. In our concrete conditions, our organization and the guiding thought of Akram Yari are identical. ‘Outside’ this, you can find “Maoism” without guiding thought and even against thesis of (Guiding Thought). For example: Communist Maoist Party of Afghanistan, rejects and ridicules thesis of Guiding Thought and Great Leadership by naming them as Non-Maoist appendages of Gonzalo. So, in our concrete reality, we are the first to accept and adopt “thought” and “people’s war until communism”! Our organization is the embodiment of Akram Yari Thought. What were Ibrahim Kaypakkaya’s main documents? Ibrahim Kaypakkaya, who died at the age of 21, wrote four main documents. These documents are the basic documents for the foundation of the TKP/ML (Communist Party of Turkey / Marxist-Leninist). The first one, written at the beginning of 1972 after the formation of the TKP/ML, is called “General criticism of the revisionism of the Safak (Aydınlık) by the TKP/ML”. Safak (Dawn) was the illegal central organ of the revisionist Revolutionary Workers and Peasants Party of Turkey, whereas Aydınlık (Clarity) was the legal organ upholding the line of this Party. The “General criticism” made by Ibrahim Kaypakkaya consists in 11 articles and a long document called “The main points that separate us from the Safak – revisionism”; the whole forms a book of 150 pages. The three others documents of Ibrahim Kaypakkaya, which make 60 pages each, are more famous. In January 1972, Kaypakkaya wrote “Criticism of the program of the TIIKP (Aydınlık)” and “Views on kemalism”. The first document is a criticism of the revisionist TIIKP in the spirit of the “General criticism”, whereas the second one is the very important document where he characterizes kemalism as fascism. In December 1971, he had also wrote “The national question in Turkey”, where he deals with the Kurdish question, rejecting the chauvinism of revisionism and defending the right of self-determination. What were Siraj SIkder’s main documents? Siraj Sikder produced a lot of documents. Since when he started his political activity as a Maoist Leader, his pen never stopped. More than one hundred documents are found till now. He wrote ideological, organizational, political, military, poetry, literary critique. What were Gonzalo’s main documents? Gonzalo’s main document are, besides the well known interview from 1988 and “Ila-80”, the documents of the first congress of the reconstituted Communist Party of Peru which form the Basis of Party Unity (BUP): “Marxism-Leninism-Maoism”, “Gonzalo Thought”, “International Line”, “Democratic Revolution”, “Military Line”, “The Line of Construction of the Three Instruments of the Revolution”, “The Mass Line”. To be added is also the speech held in September 1992 whereas he was arrested (“We are here in these circumstances. Some think this is a great defeat. They are dreaming! We tell them to keep on dreaming. It is simply a bend, nothing more, a bend in the road! The road is long and we shall arrive. We shall triumph! You shall see it! You shall see it!”). What were Alfred Klahr’s main documents? 2. the “Auschwitz text”, written in the concentration camp Auschwitz-Birkenau, synthesis of the debates made there between Austrian and German communists (Klahr managed to escape, but died afterwards in Warsaw, shot by the SS). Did the revolutionary Akram Yari launch people’s war? Akram Yari himself could not launch people’s war. He was still so young he fell sick, and got schizophrenic. For second, he was murdered by revisionist PDPA when he was still young. But, his teaching paved the way for future possibility of launching revolutionary armed struggle and finally the Protracted People’s War. For example, revolutionary struggle launched by revolutionary Mao-Thought groupings against “Soviet” social imperialist invasion in Afghanistan, which was launched by then revolutionary organizations such as “SAMA” in first half of 1980s came from teachings of Akram Yari. Did the revolutionary Ibrahim Kaypakkaya launch people’s war? Yes, Ibrahim Kaypakkaya found TIKKO, the Workers’ and Peasants’ Liberation Army of Turkey (Türkiye İşci ve Köylü Kurtuluş Ordusu). Ibrahim Kaypakkaya himself was severely wounded during a fight with the reactionary army in the mountain of Dersim; he managed to escape, however, he was captured a week afterwards. He was forced to walk barefoot over 50 km snow and icy rivers from city to city, then put in Diyarbakirs prison for nearly four months, where he was in solitary confinement and systematically tortured. He was finally shot by the reaction as he revealed absolutely no information. Did the revolutionary Siraj Sikder launch people’s war? After taking up Marxism-Leninism Mao Zedong thought as the third stage of Marxism, he led proletariat to form its organization to develop a proletarian party. Under his leadership preparatory organisation of party – the East Bengal Workers Movement initiated armed struggle in 1968 and Proletarian party of East Bengal was formed in 1971 in liberated area when party was carrying people’s war. Apart from countrywide armed struggle, party could establish Base Area twice: once in Payarabagan forest of river delta of Barisal district (in 71) and later in Chittagong Hill Tract during 72 to 75. When comrade Siraj Sikder was arrested and killed by the Awami League Government at the young age of 30 in 1975, party and armed struggle got weakened, but armed activities continued. Did the revolutionary Gonzalo launch people’s war? Gonzalo, as leader of the Communist Party of Peru, led the reconstitution of the Party, its organization towards People’s War, the launching of the People’s War in 1980, and the development of it it, until its arrest in 1992. Did the revolutionary Alfred Klahr launch people’s war? Alfred Klahr’s party was very weak in the 1920’s, it had to face fascism in 1934 and then the Nazi occupation in 1938. The illegal activities was a part of the general antifascist struggle. There was no particular consideration from Alfred Klahr about armed struggle. Was Akram Yari recognized as a new leader? Chairman Akram Yari was recognized as a new leader from the beginning of the Maoist movement in Afghanistan. He was the first Maoist leader in Afghanistan, and was the initiator and founder of Maoist Line in Afghanistan. Until now, there is no Maoist neglecting his leadership and his initiative as the leader of the movement of New Democracy of Afghanistan. Was Ibrahim Kaypakkaya recognized as a new leader? Yes, Ibrahim Kaypakkaya became the great figure of the Maoist movement in Turkey. Yet, it is to notice that the Turkish reactionary state made all to ban anything that has to do with him, whereas on the other side, the romanticism of the guevarist Mahir Cayan was considered as half acceptable, and the romanticism of the hoxhaist Deniz Gezmis nearly authorized. Until today, the figure of Ibrahim Kaypakkaya is central for Maoists or even “marxist-leninists”, who of course pretend to “correct” him, negating the reference to Mao Zedong, the people’s war, the New Democratic Revolution. Was Siraj Sikder recognized as a new leader? Comrade Siraj Sikder was recognized as the most prominent Maoist leader of East Bengal and at the same time as a great national leader in the history of East Bengal. Was Gonzalo recognized as a new leader? Yes, Gonzalo was recognized as the leader of the red fraction fighting revisionism, as the leader of the new Party, as the individual carrying the thought necessary for the New Democratic and then Socialist Revolution in Peru. He became an essential person for the history of modern Peru. Was Alfred Klahr recognized as a new leader? The conditions were not made that Alfred Klahr took the lead of the Party; after the defeat of Nazi Germany, the new direction of the Communist Party of Austria was already going in a revisionist trend. Therefore, Alfred Klahr’s work was not taken in consideration. Nevertheless, Alfred Klahr was the first to affirm that the Austria nation exist and that this reality would increase in the conscience of the masses. This was indeed true, more and more, exactly as Klahr predicted it. Klahr’s prestige grew so, but only in some intellectual circles and without any ideological conclusion from it. Did Akram Yari consider that People’s War is universal? Chairman Akram Yari reaffirmed himself in Chairman Mao’s teaching that’s says: political power grows out of the barrel of a gun. He declared that: the question of power, power for proletariat, is the basic point in Mao-Thought, and it is a universal rule that: only through revolutionary armed struggle it is possible to overthrow reactionaries of the world. There is no existing documentary evident that Chairman Akram Yari used PW for all countries, as universal. Indeed, it was Chairman Gonzalo who for the first time publicized such documentary stand based in Chairman Mao’s teachings. But, comrade Akram, by considering revolutionary armed struggle in all countries, as universal road to power for proletariat, indeed, has laid the foundation for this concept in Afghanistan. Our organization (OWA-MLM-p-Maoist) developing chairman Akram Yari’s line, bases itself in recognition of PPW (protracted people’s war) as universal and until communism. Indeed, it is comrade “X” the leader of our organization, who has developed Chairman Akram Yari’s revolutionary line, by enriching it with chairman Gonzalo’s doctrine of recognition of universality of people’s war until communism. Did Ibrahim Kaypakkaya consider that People’s War is universal? Kaypakkaya didn’t deal with this question. However, dealing with the question of the red political power following Mao’s conceptions, Ibrahim Kaypakkaya affirms that “The red political power is possible in all backwarded countries, colonial like semi-colonial. Did Siraj Sikder consider that People’s War is universal? This is chairman Gonzalo in Peru who first put forward the idea of universality of People’s war. During the time of Siraj Sikder, it was only Protracted People’s war that was the idea of oppressed countries to make revolution. Did Gonzalo consider that People’s War is universal? Gonzalo is the one who theorized the universality of Peope’s War. “With regard to violence we start from the principle established by Chairman Mao Zedong: violence, that is the need for revolutionary violence, is a universal law with no exception. Revolutionary violence is what allows us to resolve fundamental contradictions by means of an army, through people’s war. Why do we start from Chairman Mao’s thesis? Because we believe Mao reaffirmed Marxism on this question, establishing that there are no exceptions whatsoever to this law. What Marx held, that violence is the midwife of history, continues to be a totally valid and monumental contribution. Lenin expounded upon violence and spoke about Engels’ panegyric praise of revolutionary violence, but it was the Chairman who told us that it was a universal law, without any exception. That’s why we take his thesis as our starting point. This is an essential question of Marxism, because without revolutionary violence one class cannot replace another, an old order cannot be overthrown to create a new one – today a new order led by the proletariat through Communist Parties. The problem of revolutionary violence is an issue that is more and more being put on the table for discussion, and therefore we communists and revolutionaries must reaffirm our principles. The problem of revolutionary violence is how to actually carry it out with people’s war. Did Alfred Klahr consider that People’s War is universal? Klahr lived before the international affirmation of the People’s War. Did Akram Yari quote literature? Chairman Akram Yari had studied Faculty of Science. He was also a self-promoted individual in Literature and literary works. Besides, he was the most outstanding figure in Marxist studies of the time. The remnants of his writings in prose proven his highly educated intellect. No one at his time argued being superior to him in social studies. Did Ibrahim Kaypakkaya quote literature? No, Ibrahim Kaypakka’s works don’t contain such references. Did Siraj Sikder quote literature? He wrote some articles on literature. He wrote a preface of his poetry book: People’s war in Panorama. He wrote critical criticism on Sukanto Bhattacharjee, a revolutionary poet of British colonial Bengal. He wrote an article on Sarat Chandra Chattrapadhyay, the most popular Bengali novelist of British colonial Bengal and evaluated him as national democratic writer of Bengali literature. It is believed that he participated in writing a book on women liberation in perspective of Vietnam entitle: Mekong daughter sings the song of liberation. “What do I like to read? I read a lot of biographies. I think that literature is a great form of artistic expression. For instance, I like to read Shakespeare, yes, and to study him. When you study Shakespeare you find political issues. There are very clear lessons in Julius Caesar for example, and in MacBeth. I like literature, but politics always wins out with me, and leads me to look for the political significance, what is behind it. After all, behind every great artist there is a political leader, there is a man of his time who is waging class struggle. Did Alfred Klahr quote literature? Alfred Klahr didn’t quote literature in his articles, nevertheless in one article about the Austrian nation, he refers to authors who represent the Austrian culture as it was separating from the rest of Germans. Did Akram Yari write poetry? Until now, we have no piece of poetry of him. It is still uncertain. Did Ibrahim Kaypakkaya write poetry? No, not for what is known. Did Siraj Sikder write poetry? Yes, Siraj Sikder wrote a poetry book: People’s war in Panaroma. We give a few examples of his verses. No, nevertheless he wrote some really famous texts for the Communist Party of Peru, characterized by a very high level of poetic prose. The most famous is “Initiate the Armed Struggle in 1980”, aka “ILA-80”. “We are all subjected to the storm; the wind blows away the leaves, but the seeds remain. In 1927, a great storm led to the birth of the Communist Party of Peru (PCP). The Party has entered a great storm; everything will be set ablaze. For a long time, we have sought to become a polar center. The path we are undertaking is correct, and all the problems we face will be resolved. Today is the day of pledging to the flag, but ours is the Red Flag, a distinct one, with the hammer and sickle. “We are Communists of a distinct temperament and special material, we are Communists ready for everything and we know what needs to be fought. We have already fought it and will fight it again tomorrow. What will be confronted tomorrow will be the child of the present, it will be harder but by then we will be tempered by the past and as we forge ourselves today. We will temper our souls in the revolution, this is the only flame capable of forging us. We need a great deal of optimism and there is a reason for it. We are the makers of tomorrow, we are guides, the garrison of the invincible triumph of the class. This is why we are optimists. We are enthusiastic by nature. We are nurtured by the ideology of our class: Marxism-Leninism Mao Zedong Thought. We live the life of the class. We participate in its heroic deeds. The blood of our people flow and burns within us. We are like a powerful and palpitating blood. Let us take the unbendable iron and steel, the class, and mix it together with the unwithering light of Marxism-Leninism Mao Zedong Thought. Enthusiasm means to participate in the force of the Gods, therefore, we are full of enthusiasm. We participate in the divinities of the real world: The masses, the class, Marxism and the revolution. That is why we have inexhaustible enthusiasm. “I’d say that sometimes in politics you have to let yourself go, so that the passion, the deep feelings, can strengthen our determination. At such times, so they say, the heart speaks and I believe that the revolutionary passion which is indispensable for war expresses itself. “At one time I was surveying world poetry in an anthology. And I studied it before, too–there were some works at the university library that I had access to. I like poetry. It is another one of the things I admire about Chairman Mao, who was an extraordinary poet. As to Peruvian poetry, for me, Vallejo. Did Alfred Klahr write poetry? It doesn’t seem that Alfred Klahr wrote poetry. Did Akram Yari start his revolutionary career from school times? Yes. He began his work while still he was a student at school. After graduation from university, he became a teacher at high school, and there, he trained hundreds of young school boys as future revolutionaries. The foundation of PYO (Progressive Youth Organization) roots from those years. Did Ibrahim Kaypakkaya start his revolutionary career from school times? Ibrahim Kaypakkaya died at 21 after having being tortured for nearly four months; he had already build the party and the liberation army. It shows what his life was before. Kaypakkaya discovered revolutionary ideas, as he was a student in the Istanbul University’s Science Faculty, Physics Branch. He joined in the foundation of the Capa Idea Club in March 1968; becoming its president. He was then expelled from school in November 1968 because of preparing a leaflet against the American 6th Fleet. He afterwards wrote articles in the revolutionary left press, and became soon a leader. Did Siraj Sikder start his revolutionary career from school times? Yes, Comrade Siraj Sikder started his revolutionary career since his high school time. He was involved with pro Peking left wing Students’ Union. When he was studying in Ahsanullah Engineering College, he was elected as the central vice president of the same organization. Did Gonzalo start his revolutionary career from school times? “I’d say that what has most influenced me to take up politics has been the struggle of the people. I saw the fighting spirit of the people during the uprising in Arequipa in 1950 – how the masses fought with uncontainable fury in response to the barbarous slaughter of the youth. And I saw how they fought the army, forcing them to retreat to their barracks. And how forces had to be brought in from other places in order to crush the people. This is an event that, I’d say, has been imprinted quite vividly in my memory. Because there, after having come to understand Lenin, I understood how the people, how our class, when they take to the streets and march, can make the reactionaries tremble, despite all their power. Another thing was the struggles of 1956, when the people fought, while others betrayed them – well, that is what the opportunists and reactionaries do – but the people fought and carried the day, and there were mass movements, powerful ones. These events, for example, helped me understand the power of the masses, that they make history. “My interest in politics began to develop at the end of high school, based on the events of I950. In the following years, I remember forming a group with my schoolmates to study political ideas. We were very eager to study all kinds of political ideas. You can probably understand what kind of period that was. That was the beginning for me. Then in college, the struggle at the university, I experienced firsthand big strikes, confrontations between Apristas and communists, and debates. And so my interest in books was sparked. I liked it, I began to study Marxist books. Then the figure of Comrade Stalin made a big impression on me. At that time people who were drawn to communism and those who became Party members were trained using Problems of Leninism. It was our mainstay and I studied it as it deserved to be studied, seriously, given its importance. Stalin’s life interested me. He was, for us, an example of revolution. I had problems getting into the Communist Party. They had an absurd policy. To become a member, you had to be the son or daughter of a worker, and I wasn’t. But others had different criteria and so I was able to join the Party. I participated in the defense of Stalin. At that time, taking him away from us would have been like taking away our soul. In those days, the works of Stalin were more widely propagated than those of Lenin. That’s what the times were like. Later I made a trip to Ayacucho for work reasons. I thought it would be a short stay, but it lasted for years. I thought it would just be for a year, because that’s what the arrangements were. I had my plans, the proletariat had others. The masses and the people change us in many ways; Ayacucho helped me discover the peasantry. At that time, Ayacucho was a very small town, mainly countryside. If you go to the poor sections, even today, you find peasants there, and if you walk towards the outskirts, in fifteen minutes you’re already in the countryside. There too, I started to understand Chairman Mao Zedong, I advanced in understanding Marxism. The conflict between Marxism and revisionism has been very important in my development. He lent it to me on the condition that I’d return it. Obviously it was an understandable theft. The letter led me to get more deeply into the great struggle between Marxism and revisionism. I committed myself to work within the Party and to wipe out revisionism, and I believe that together with other comrades we achieved it. We gave up on one or two who were too far gone, they were dyed-in-the-wool revisionists. Ayacucho was of enormous importance for me, it has to do with the revolutionary road and Chairman Mao’s teachings. Did Alfred Klahr start his revolutionary career from school times? Born in September 1904, Alfred Klahr joined already when he was an adolescent the Communist Youth Union, who was born in Austria following the 1917 revolution in Russia. Becoming a student, he joined also the Communist Group of Students (KOSTUFRA). Afterwards, he stayed for some months in Berlin working at the redaction of the Rote Fahne (Red Flag), central organ of the Communist Party of Germany, to work afterwards for the Rote Fahne of Austria. Then, he worked from 1930 to 1932 in Moscow as representative of the Communist Youth Union of Austria. At the end of this period, he became representative of the Rote Fahne of Austria. If Akram Yari was alive would he succeed promoting a more developed thought, as Gonzalo Thought? MLMs uphold that: line is decisive. So, it is the development of correct line of Akram Yari that gave rise to Akram Yari Thought which was developed by Organization of the Workers of Afghanistan (Marxist-Leninist-Maoist, principally Maoist) under leadership of comrade “x”. Was not it chairman Gonzalo who formulated Maoism from that of Mao-Thought? And was not it chairman Gonzalo who developed it by contributions of a highly universal recognition? As is the case for Akram Yari and comrade”X”. As was the case with Mariategui and Chairman Gonzalo in Peru. Chairman Akram Yari generated the Thought, and we are developing and expanding it by upholding, defending and applying Maoism to the concrete conditions of our country and this will be done by waging PPW and continuing it until Communism. It is Chairman Akram Yari’s line, which contributes as a core in formation of Akram Yari Thought, and it is the guarantee of triumph. If Ibrahim Kaypakkaya was alive would he succeed promoting a more developed thought, as Gonzalo Thought? Certainly, as Ibrahim Kaypakkaya managed to understand the reality of Turkey’s society, with the main question of bureaucratic capitalism and the national Kurdish question. If Siraj Sikder was alive would he succeed promoting a more developed thought, as Gonzalo Thought? Siraj Sikder already made many contributions in theory and practice of revolution in East Bengal. He was one of the most developed figures of contemporary communist movement of the world. So, if he was alive, as we know the general tendency of material law, Bangladesh revolution could succeed and naturally the leadership and thought would develop, and, without a thought there can be no revolution. If Alfred Klahr was alive would he succeed promoting a more developed thought, as Gonzalo Thought? Alfred Klahr’s thought could not develop itself, because of the concrete conditions of Austria. It was more the product of the ideological and political birth of the Austrian working class trying to surpass the really strong and very radical social-democratic stage that preceded. With the weight of revisionism in the Communist Party in Austria, but also of social-democracy, following 1945, it would have been really hard for Klahr to forge a revolutionary line in this difficult context. When a class moves in the direction of taking power, it must build strong abilities in all fields, and of course it is more true than ever in the case of the working class, which must have an all powerful cultural and ideological system, permitting to understand all aspects of a society and to revolutionize it. Gonzalo played a historical role in permitting to understand this. “We need a great deal of optimism and there is a reason for it. We are the makers of tomorrow, we are guides, the garrison of the invincible triumph of the class. This is why we are optimists. We are enthusiastic by nature. We are nurtured by the ideology of our class: Marxism-Leninism Mao Zedong Thought. We live the life of the class. We participate in its heroic deeds. The blood of our people flow and burns within us. We are like a powerful and palpitating blood. When the French bourgeois revolution stretched out at the end of the 18th century, there was the historical need for an epic mobilization of the masses. The bourgeoisie dived in the past, looking for something that could appeared as near as possible to their own needs and took what could be a design to galvanize the struggle: the Roman republic. Napoleon, moving from the figure of a Roman general to an imperial Cesar, was the toy of a historical process where he led international changes needed by the French bourgeoisie to fully develop itself in the conquest of power. Karl Marx and Friedrich Engels have explained this ideological question, removing the ideological mists and bourgeois pretensions of making the last and total revolution. But they did not integrate this ideological-cultural question in scientific socialism, because at their time there was no new democratic / socialist revolution in the world. With the socialist revolution in Russia in October 1917 and the new democratic revolution in China winning in 1949, dialectical materialism formulated scientifically the question of avant-garde, of the revolutionary party. Revolutionary ideology leads the revolutionary process; in the revolutionary party itself, two-line struggles arise in the process: the life of the Communist Party obeys also to the rules of dialectical development. And so do thoughts, as they are the reflect of the world, of matter in dialectical movement, at the dimension of the universe itself. “Thought consists in molecular and chemical motions in the brain, motions that are matter and that are the consequence of the movement of matter outside the body – the exterior movement is perceived. In this movement of perception, gray matter develops itself – it comes to synthetic understanding of the dialectical movement of matter. In the 13th century, French reaction had to struggle against materialist theses in the University of Paris. These theses were the logical conclusions of the thought of Averroes (1126-1198), the great thinker of the Falsafa, the arabo-persian philosophy. The Church had forbidden 13 theses in 1270, and among them: “The proposal: ‘man thinks’ is false or incorrect”, “Freewill is a passive power, not active, which is driven by the need of desire”, “Human’s will wants and chooses by necessity”, “There has never been a first man”, “The world is eternal”, “There is only one intellect numerically identical for all men”. These theses are correct and an expression of materialism. When is spoken about a thought, it is not spoken about the thought of an individual, even if an individual expresses it. Individuals do not think. Humankind is matter in movement, thought is merely a reflect of the movement. There can not be individual thought, what indivuals thinks is the expression of desire and necessity. Gonzalo did not only call to revolutionary optimism because there was the need of epic struggles. This would be subjectivist and not conform to communist ideology, that tends to the future and not to the past. So, along the call for enthusiasm, he formulated the conception that in each country arises a revolutionary thought, synthesizing society and affirming the correct way to resolve the social contradictions. History in motion produces enthusiasm and the correct understanding of reality in the thoughts of the masses, of the avant-garde, of the revolutionary leadership. Each national society knows contradictions, that the communist thought analyzes, producing the revolutionary synthesis that consists in the revolutionary program and the methods to realize it. In Russia and China, Lenin and Mao Zedong knew not only the political situation, but also precisely the economical situation and the cultural-ideological aspects. They often quoted literary works and made references to their own culture, of the cultural-ideological situation of the masses (for example the relationship of authority in the countryside, the emergence or not of capitalism in the countryside, etc.). In numerous others situations, revolutionary leaders produced a thought, a synthesis of their own reality. In Peru, José Carlos Mariátegui wrote in 1928 a full analysis of the history of his country: “Seven Interpretive Essays on Peruvian Reality”, which explains the history of the process of colonization, the situation of the countryside and of the Quechua Indians, etc. In Italy, Antonio Gramsci, one of the founder of the Communist Party in 1926, studied in the same way the culture and the history of its country, understanding the nature of the Italian state and the historical contradiction between the north and the south (mezzogiorno) of the country. Alfred Klahr was the first theoretician to explain that his country Austria was a nation (“On the national question in Austria”, 1937) and how German nazism was not only under control of the imperialist capital, but also of the Junkers. Ibrahim Kaypakkaya, born in 1949 and killed by the Turkish state in 1973, produced a comprehensive study of the “revolution” made by Mustafa Kemal and the kemalist ideology, paving the way to a correct understanding to Turkey’s economical, political and cultural-ideological nature. Ulrike Meinhof studied the nature of dependency of West Germany, which was under control of the United States; seeing the process of economical reprise after 1945, she proposed a long term strategy of People’s War based on the poorest elements in the youth and the struggle against the US imperialist presence. She was murdered in prison in 1976. Another great revolutionary producing a thought was Siraj Sikder, in East Bengal. Born in 1944, he understood both the Pakistani and the Indian expansionism, proposing the path of agrarian revolution to obtain national independence. He was murdered in custody in 1975. Following the dialectical materialist lesson of Gonzalo, the communists have in each country the task to produce a synthesis of their own national situation, as the revolutionary contradictions are to be resolved in this frame. People’s War is not a “method” or a style of work, it is the material production of the thought, i.e. the revolutionary confrontation with the old state and the reactionary ruling classes, according a strategy based on the thought, on the revolutionary synthesis made in the practical study of a country. When the genuine revolutionary thought is produced, it seeks confrontation with the old society, at all levels. People’s War doesn’t mean only armed struggle, but also the cultural-ideological negation of the values of the old society. If the revolutionaries don’t have the level to lead the struggle in all fields, they won’t be able to make triumph the revolution and to fight the attempts of restoration of the old society. This understanding is the direct consequence of Mao Zedong’s teachings about culture and ideology and of the Great Proletarian Cultural Revolution. Gonzalo considered that our ideology was not only marxism-leninism-maoism, but marxism-leninism-maoism principally maoism. He wanted to show that our ideology is a synthesis and not an assembly of teachings. In the same way, he considered that in each country, the ideology was marxism-leninism-maoism and the thought, principally the thought (for example in Peru: marxism-leninism-maoism Gonzalo thought, principally Gonzalo thought). The “thought” is genuine and correct only if it means a real confrontation on all aspects of old society, the practical aspect being on the forefront. During the 1990’s-2000’s, the Peru Popular Movement (MPP), organism generated by the Communist Party of Peru for the work abroad, led an important work to promote marxism-leninism-maoism. Unfortunately, when moving to the practical national aspects, the MPP only called to follow Peru’s example and has never been able to help communists to produce a synthesis of their own situation. The MPP never called to study the national realities, and instead of this promoted a cosmopolitism consisting in reproducing a style of work in a stereotyped manner. 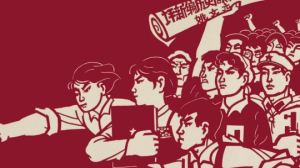 Instead of accompanying genuine revolutionary forces to marxism-leninism-maoism, the MPP came the point to support centrists, as they were recognizing maoism in words. This is an example of misunderstanding the main aspect. What counts is not to assume People’s War in an abstract way, but People’s War based on Thought. Revisionism in Nepal is a good example: despite of assuming “People’s War”, what was called “Prachanda’s path” never had a high cultural-ideological level, whereas it contained already numerous errors concerning the basic principles of dialectical materialism. Our horizon is the following: in each country, a communist thought must be produced, synthesis of the society, showing the way to resolve the contradictions. Communists can not make a revolution in their own country without having a high level on the cultural-ideological fields. The masses live in a culture full of music, movies, literature; the teachings of the Great Proletarian Cultural Revolution remember us the importance of the struggle in this field. The communists in the world must exchange their experiences and their knowledge; on many fields, they have the same struggles to lead. If the communists are not able do this, the reactionary ruling classes will produce an ideology diving in the past to “regenerate” society, a false “socialism”, which is fascism. Each thought is so of historical significance; it is the basis of People’s War. Each thought permits to launch the People’s War, that destroys the old state, and as this process generalizes itself, it becomes a world People’s War. The thought becomes then the synthesis of the world society that emerges on the rubbles of imperialism, paving the way for the building of a world communist society.